The winners with the organisers, Iszuan (fourth right), Shaifulbahari (fourth left) and Akram (third left) after the prize presentation. 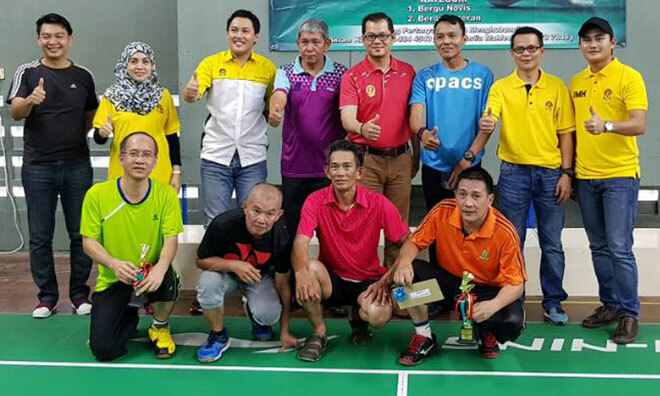 KUCHING: Saie Kip and Awang Jemi clinched the Saberkas Badminton Tournament Veteran doubles title when they beat Kelana Ali Hassan and Jemuri Hasbie in the final at Persatuan Badminton Bumiputera Sarawak (PBBS) hall at Semariang last Sunday. In joint third were Awang Ahmad-Zamahari Eddie and Abng Iskandar-Awang Dahlan. The Novice doubles category saw Naklia Brahim and Aznor Afiq defeating Zahid Sidi and Rodzaimie Bujang in the final. Mohd Shahrizal-Awang Johari and Abang Syazwan-Nik Azree finished joint third. Saberkas Sarawak executive secretary Iszuan Heroni and PBBS deputy president Shaifulbahari Shukri gave away the prizes. This tournament is organised by Saberkas Muda Hashim with the cooperation of PBB Youth Muda Hashim Tengah. Saberkas Muda Hashim secretary Mohamad Akram Mohamed said the competition attracted 52 pairs in the Novice and 19 pairs in the Veteran, with players coming from Sri Aman, Serian, Kota Samarahan, Kuching and other districts.